Besides atherosclerosis and lung cancer, smoking is considered to play a major role in the pathogenesis of autoimmune diseases. It has long been known that there is a connection between rheumatoid factor-positive rheumatoid arthritis and cigarette smoking. Recently, an important gene–environment interaction has been revealed; that is, carrying specific HLA-DRB1 alleles encoding the shared epitope and smoking establish a significant risk for anti-citrullinated protein antibody-positive rheumatoid arthritis. We summarize how smoking-related alteration of the cytokine balance, the increased risk of infections (the possibility of cross-reactivity) and modifications of autoantigens by citrullination may contribute to the development of rheumatoid arthritis. It has long been known that there is a connection between seropositive rheumatoid arthritis (RA) and smoking. The exact underlying mechanism, however, has only been speculated. Cigarette smoking is one of the major environmental factors suggested to play a crucial role in the development of several diseases. Disorders affecting the great portion of the population, such as atherosclerosis, lung cancer or cardiovascular diseases, are highly associated with tobacco consumption. More recently, it has been reported that smoking is involved in the pathogenesis of certain autoimmune diseases such as RA, systemic lupus erythematosus, systemic sclerosis, multiple sclerosis and Crohn's disease. Firstly, Vessey and colleagues described an association between hospitalization due to RA and cigarette smoking, which was an unexpected finding of their gynecological study . Since then several population-wide case–control and cohort studies have been carried out . For example, a population-based case–control study in Norfolk, England showed that ever smoking was associated with a higher risk of developing RA . Only an early Dutch study from 1990 involving female RA patients (control patients with soft-tissue rheumatism and osteoarthritis) reported that smoking had a protective effect in RA, albeit they only investigated recent smoking and their controls were not from the general population . Investigations have elucidated that many aspects of RA (rheumatoid factor (RF) positivity, severity, and so forth) can be linked to smoking. Recent data suggest that cigarette smoking establishes a higher risk for anti-citrulli-nated protein antibody (ACPA)-positive RA. 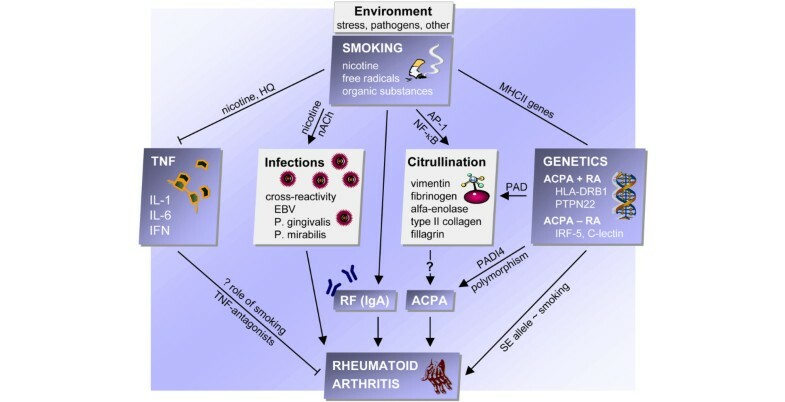 In the present paper we attempt to give a thorough review of this field, concerning the main facts and hypotheses in the development of RA in connection with smoking. Smoking is considered to have a crucial role in the pathogenesis of many diseases and, as a significant part of the population smokes, it is one of the most investigated and well-established environmental factors. Cigarette smoke represents a mixture of 4,000 toxic substances including nicotine, carcinogens (polycyclic aromatic hydrocarbons), organic compounds (unsaturated aldehydes such as acrolein), solvents, gas substances (carbon monoxide) and free radicals . Many data suggest that smoking has a modulator role in the immune system contributing to a shift from T-helper type 1 to T-helper type 2 immune response; pulmonary infections are increased, immune reactions against the invasion of microorganisms are depleted (see below), and (lung) tumor formation is augmented. Exposure to cigarette smoke results in the depression of phagocytic and antibacterial functions of alveolar macrophages (AMs) (Table 1) [6, 7]. Although AMs from smokers are able to phagocytose intracellular bacteria, they are unable to kill the bacteria – which consequently implies the deficiency of these cells in smokers . Cigarette smoke condensate, administered to mice, leads to a decrease in primary antibody response . Chronic smoking results in T-cell anergy by impairing the antigen receptor-mediated signaling . Exposure to cigarette smoke results in the depression of phagocytic and antibacterial functions of alveolar macrophages [6, 7]. Killing of intracellular bacteria in smokers' alveolar macrophages is impaired . Owing to smoke condensate, the primary immune response is diminished . Chronic smoking causes T-cell anergy [10, 15]. Nicotinic acetylcholine receptor is involved in the suppression of antimicrobial activity . Nicotine decreases the induction of antigen-presenting cell-dependent T-cell responses in dendritic cells . Nicotine attenuates neutrophil functions such as superoxide production . Due to smoke exposure, lipopolysaccharide-induced TNF secretion of alveolar macrophages from experimental animals is decreased [11, 12]. Smokers' alveolar macrophages release less TNFα, IL-1 and IL-6 [13, 14]. Nicotine decreases the production of IL-12 in dendritic cells . Nicotinic acetylcholine receptor is involved in the downregulation of IL-6, IL-12, and TNFα . Acetylcholine attenuates the release of TNF, IL-1 and IL-6 in lipopolysaccharide-induced human macrophage cultures . Hydroquinone causes suppression in the production of IL-1, IFNγ and TNFα in human macrophages . Hydroquinone inhibits IFNγ secretion in lymphocytes . Unsaturated aldehydes evoke the release of IL-8 and TNFα in human macrophages . Smoke contains high amounts of free radicals. Smoke induces the depletion of intracellular glutathione, resulting in cell injury . Owing to smoking, redox-sensitive NF-κB and activator protein-1 are activated . Activator protein-1 is a cis-acting factor bound to the promoter of PAD4 . Agents, acting on cysteine sulfhydril groups, inactivate peptidyl arginine deiminase, while reduced compounds enhance its activity . Peptidyl arginine deiminase expression and activity are increased in the lungs of smokers . Smoking has an anti-estrogenic effect through the formation of inactive estrogens . Smokers have higher levels of serum fibrinogen . Smoking induces a decline in TNF production, which is supported by several data in the literature. In the work of Higashimoto and colleagues, in vivo exposure to tobacco smoke caused a significant decrease in the production of TNFα by AMs after lipopolysaccharide (LPS) stimulation. In vitro exposure of AMs to tobacco smoke extracts (water-soluble extracts) also caused a drop in the secretion of TNFα with stimulation of LPS . Owing to chronic smoking, AMs from rats significantly increase the generation of superoxide anion and release high amounts of TNFα after smoking sessions; when challenged with LPS, however, even though a more pronounced cytokine secretion can be found, it is not as marked as in the control groups . It therefore seems that macrophages of experimental animals are activated, but at the same time are somehow depressed, and respond less to LPS. In line with the abovementioned observations, the capacity of AMs of healthy smokers to release TNFα, IL-1 and IL-6 is significantly decreased [13, 14]. Data on alterations of macrophage functions by nicotine (such as pinocytosis, endocytosis, microbial killing and reducing TNFα secretion induced by LPS) date back more than 40 years . It is known that various kinds of immune cells carry nicotinic and muscarinic acetylcholine receptors (T cells and B cells), through which the nervous system and also the immune system itself can modulate and coordinate the proliferation, differentiation and maturation of immune cells . It is suggested that the major portion of acetylcholine in the circulating blood originates from T-cell lines. The thymic epithelium as well as T cells in the thymus express nicotinic acetylcholine receptor, as do mature lymphocytes . Chronic smoking leads to T-cell anergy, while its acute effects are primarily mediated via the activation of the hypothalamic–pituitary–adrenal axis [10, 15]. The nicotinic acetylcholine receptor is involved in the suppression of antimicrobial activity and cytokine responses (downregulation of IL-6, IL-12, and TNFα, but not that of the anti-inflammatory cytokine IL-10) of AMs . In recent work of Borovikova and colleagues, acetylcholine significantly attenuated the release of cytokines (TNF, IL-1 and IL-6, but not anti-inflammatory IL-10) in LPS-induced human macrophage cultures . Particularly the α7 subunit, mediated by the inhibition of NF-κB, has a role in the alteration of cytokine responses . Nicotine also affects the quality of antigen presentation: in mature dendritic cells, nicotine exposure decreases the production of proinflammatory T-helper type 1 IL-12, and decreases the capacity of dendritic cells to induce antigen-presenting cell-dependent T-cell responses. Other reports contradict this, however, suggesting that the effect of nicotine on mature dendritic cells is proinflammatory in nature. Moreover, nicotine alters various neutrophil functions; for example, attenuates super-oxide anion production . All of these data suggest an immunosuppressive effect of nicotine on the immune system, inhibiting various functions of almost all immune cell types. Hydroquinone is found in high concentrations in cigarette smoke, causing prominent suppression in the production of IL-1, IFNγ and TNFα in human peripheral blood macrophages . Hydroquinone seems to also significantly inhibit IFNγ secretion in lymphocytes in a dose-dependent manner. In addition, hydroquinone treatment results in the reduction of IFNγ secretion in effector CD4+ T cells and T-helper type 1-differentiated CD4+ T cells. These findings provide evidence that hydroquinone may suppress immune responses and contribute to the increased incidence of microbial infections caused by cigarette smoking . Besides hydroquinone, other organic compounds are also present in cigarette smoke. Certain data suggest that unsaturated aldehydes such as acrolein and crotonaldehyde, contained in the aqueous phase of cigarette smoke extract, can evoke the release of neutrophil chemoattractant IL-8 and TNFα in human macrophages , which can be inhibited by N-acetyl-cysteine or glutathione monoethyl ester. Endogenous unsaturated aldehydes are found in high amounts in chronic obstructive pulmonary disease patients and are involved in the promotion of inflammation, so the exogenous analogues in smoke may have similar effects impeded by glutathione derivates. Chronic smoking as a repetitive trigger causes marked oxidative stress in the body , which might be responsible for a constant inflammatory process. High amounts of exogenous free radicals contained in smoke can react to endogenous nitrogen monoxide, producing the harmful peroxy nitrite and decreasing the protective effect of nitrogen monoxide. Smoke also induces the production of endogenous free radicals; for example, reactive oxygen species (peroxide, superoxide, hydroxyl ion). Oxidative free radicals can lead to a wide variety of damages in cells via lipid peroxidation as well as via the oxidation of DNA and proteins, resulting in apoptosis. Several enzymes (for example, α1-protease inhibitor) containing redox-sensitive amino acids (cysteine or methionine) in their catalytic site can lose their activity or can undergo conformational changes. This may cause a higher susceptibility for degradation or may challenge the equilibrium of proteases/protease inhibitors. The oxidant/antioxidant imbalance may activate redox-sensitive transcription factors such as NF-κB and activator protein-1, which regulate the genes of proinflammatory mediators (IFNγ) and protective antioxidants . Normally, TNF can lead alternatively to activation of NF-κB or to apoptosis, depending on the metabolic state of the cell. Nicotine, as mentioned above, reduces TNF release of AMs and consequently promotes less NF-κB activation through TNF; however, the increased oxidative stress would permit and contribute to NF-κB activation. In accordance with this observation, mild exposure to cigarette smoke can induce NF-κB activation in lymphocytes through the increase in oxidative stress and the reduction in the intracellular glutathione levels . Vapor-phase cigarette smoke can increase the detachment of alveolar epithelial cells and decrease their proliferation. Furthermore, these cells show a higher susceptibility for smoke-induced cell lysis. Reduced glutathione seems to protect against the effects of cigarette smoke exposure, and the depletion of intracellular glutathione, produced by smoke condensates, enhances cell injury . It is intriguing that there is a strong association between RA, smoking and the GSTM1 (the enzyme involved in glutathione production) null genotype . The polymorphisms of receptor activator of NF-κB (see below) have also been linked to RA , which indicates that free radicals in smoke may contribute to the pathological chain of RA development. Dong and colleagues have reported in MCF7 cells (human breast adenoma line) that estrogen enhances peptidyl arginine deiminase (PAD) type 4 (see information about PADs below) expression via the estrogen receptor alpha → activator protein-1 pathway . Chromatin immunoprecipitation and siRNA assays have also revealed that activator protein-1 is a cis-acting factor bound to the promoter of PAD4. These data suggest that free radicals in cigarette smoke might influence PAD expression via the activation of redox-sensitive factors in the respiratory tract. It is noteworthy that PAD enzyme isoforms contain highly conserved cysteine in their active site, which plays a crucial role in the catalysis process. It has been shown that agents acting on cysteine sulfhydryl groups via binding them covalently can inactivate the enzyme, while reduced compounds can enhance its activity . Free radicals in smoke produce an oxidative milieu, which may promote the formation of disulfide groups in the active site of the enzyme and may also have a disadvantageous impact on PAD. On the contrary, PAD expression and activity are increased in the lungs of smokers  – the explanation for this might be that PAD is originally located intracellularly, and citrullinated proteins may be released into the extracellular matrix after apoptosis. Another striking phenomenon is the estrogen–smoke interaction in regulating PAD genes. PAD2 expression is increased in bronchoalveolar lavage of smokers, compared with nonsmokers . The expression of PAD2 and PAD4 is also elevated in the synovium of RA patients. The expression of PAD (type 4) enzymes is dependent on estrogens . Smoking, however, has an anti-estrogenic effect through the formation of inactive 2-hydroxy catechol estrogens , which would counteract PADs. These statements suggest that the anti-estrogenic effect of smoking may not have as much importance as its other pleiotropic roles (immunomodulation, activation of redox-sensitive factors, and so forth) in the contribution to the development of ACPA + RA considering the estrogen dependence of the PAD enzyme. Fibrinogen is mainly involved in blood coagulation and inflammation. The Framingham Study has revealed that smokers have higher levels of serum fibrinogen . The citrullinated form of fibrin can be found in RA synovial tissue co-localizing with citrullinated autoantibodies . It has been reported that the polymerization of citrullinated fibrinogen catalyzed by thrombin is impaired, suggesting that the function and antigenicity of citrullinated proteins are somewhat altered, which may potentially contribute to proinflammatory responses and autoimmune reactions in the joints . RA is considered to have a complex etiology: both genetic and environmental factors contribute to the disease development [26, 34, 35]. The genetic component of RA is widely investigated : the strongest gene association is considered to be the one with the human leukocyte antigen (HLA) region, particularly the HLA-DRB1 genes accounting for about two-thirds of the genetics of RA. Certain HLA-DRB1 alleles (DRB1*0401, DRB1*0404, DRB1*0405, DRB1*0408, DRB1*0101, DRB1*102, DRB1*1001 and DRB1*1402), encoding the so-called shared epitope (SE) at amino acid positions 70 to 74 in the third hypervariable region of the DRB1 molecule, are associated with a higher susceptibility for RA . Another significant association of RA is with the polymorphism of the protein tyrosine phosphatase nonreceptor 22 (PTPN22) gene. PTPN22 is an intracellular protein expressed in hematopoietic cells; it sets the threshold of T-cell receptor signaling . PTPN22 is therefore likely to be a general risk factor for the development of autoimmunity. Certain functional variants (for example, R620W, 1858 C/T) of PTPN22 have been shown to confer a moderate risk for seropositive RA . In addition, a significant interaction between PTPN22 and smoking (>10 pack-years) has been observed in a case–control study . Other studies, however, have failed to confirm this observation. Association studies implicate the role of several other genes, including TNF receptor 2 (TNFR2), solute carrier family 22, member 4 (SLC22A4), runt-related transcription factor 1 (RUNX1) and the receptor activator gene of NF-κB (TNFRSR11A) . Furthermore, PADI4 polymorphisms have been found to confer a risk for RA only in Japanese and Korean populations, but not European populations . RA therefore can be divided into two subsets of disease entities (ACPA-positive RA and ACPA-negative RA), which are likely to be genetically distinct: HLA-DRB1 SE alleles and PTPN22 are restricted to ACPA-positive RA, while genes such as interferon regulatory factor 5 (IRF-5) and C-type lectin seem to confer risk for ACPA-negative RA . Smoking as a chronic habit is genetically determined to some extent. The major candidate genes associated with smoking are those of cytochrome P450 enzymes, which play a substantial role in nicotine metabolism, and also those of dopamine receptors influenced by nicotine in the mesocorticolimbic dopaminergic reward pathways of the brain. A significant linkage was found between the ever–never smoking trait and chromosome 6 , which is associated with the HLA genes. A Hungarian group has determined the polymorphisms of the MHC class III genes in coronary artery disease patients versus healthy individuals with defined smoking habits . A significant association between ever smoking (past and current smokers) and a specific MHC haplotype (the TNF2 allele of the promoter of TNFα) has been observed. More attempts were made to find a correlation between TNF promoter polymorphisms and RA, although most of them failed . These results suggest that genes (MHC classes) determining different aspects of smoking behavior do not seem to predispose for RA; that is, the genetics of these two entities, the habit and the disease are unlikely to have a similar genetic root. According to a Swedish population-based case–control study, there is a gene–environment interaction between smoking and the HLA-DRB1 SE genotype . The relative risk of RA was extremely high in smokers carrying single SE alleles (7.5) or double SE alleles (15.7). Nevertheless, neither smoking nor SE alleles, nor the combination of these factors, have increased the risk of developing seronegative RA . The case–control study of the Iowa Women's Health Study involving postmenopausal women has indicated a strong positive association of smoking, SE positivity and GSTM1 null genotype with RA . A Finnish population screening has showed an association between RF and smoking, but they have not investigated RA . In another study, a positive correlation was observed between smoking and RF levels; particularly, IgA RF was found to account for more severe disease . Smoking confers risk for only the seropositive form of RA , suggesting that the two disease entities may have different pathomechanisms. Certain studies support the fact that there is an association between smoking and RA only in men, but not in women  –-yet many other reports contradict this suggestion . A case–control study from Sweden has found that smokers of both sexes have an increased risk of developing seropositive RA but not seronegative RA . Many attempts have been made to clarify how smoking history (duration of smoking in years or the intensity of smoking per day) influences the development of RA. Iowa, both factors of smoking were found to be associated with RA, and were observed only in current smokers and in those ever-smokers who quit 10 years or less prior to the study . Similarly, in the prospective Nurses Health Study both smoking intensity and duration were directly related to risk of RA, with prolonged increased risk after smoking cessation . A case–control study of Sweden has reported that the increased risk for RA is established after a long duration of smoking (≥ 20 years; the intensity was moderate) and might be sustained for several years (10 to 20 years) after smoking cessation . To summarize, it seems that both smoking duration and intensity may be associated with the development of RA. The duration might be more decisive (≥ 20 years), however, and at least 10 years of smoking cessation is needed to reduce the RA risk. RA is characterized by antibodies including RF and ACPA. These data may indicate that a long duration of smoking with appropriate intensity may cause permanent immunomodulation and subsequent antibody production of memory cells, resulting in a steady state of pathological antibodies. After an unspecified time (about 10 years) of smoking cessation, these cells may disappear from the body. Clinical evaluations of patients at the University of Iowa have revealed that cigarette smoking (especially ≥ 25 pack years) was significantly associated with RF positivity, radiographic erosions and nodules . In another study there was a correlation between heavy smoking (≥ 20 pack-years) and rheumatoid nodules, a higher Health Assessment Questionnaire score, a lower grip strength and more radiological joint damage, suggesting the adverse effect of smoking on progression, life quality and functional disability . Some reports support that smoking can increase extraarticular manifestations (rheumatoid nodules, interstitial pulmonary disease, rheumatoid vasculitis) [56–58]. In the work of Manfredsdottir and colleagues, a gradual increase in disease activity was observed from never, former and current smokers defined by the number of swollen and tender joints and the visual analogue scale for pain, but smoking status did not influence the radiological progression . In a cohort of Greek patients with early RA, cigarette smoking was associated with increased disease activity and severity in spite of the early treatment . Only one study found reduced radiographic progression and generally more favorable functional scores among heavy smokers . The recent results of Westhoff and colleagues have revealed that smoking does not influence the Disease Activity Score or radiographic scores, yet smokers need higher doses of disease-modifying antirheumatic drugs, which may indicate reduced potency of these drugs due to smoking or higher disease activity that can be controlled by only high doses of drugs . One can conclude that smoking influences the course of RA in a negative way, although its extent differs in the various studies. Therefore it is essential to draw patients' attention to the expected beneficial effect of smoking cessation. Recent data have revealed that smoking is highly associated with ACPA-positive RA (Table 2). The evaluation of incident cases of arthritis (undifferentiated arthritis and RA) has revealed that tobacco exposure increases the risk of anti-cyclic citrullinated protein (anti-CCP) antibodies (see information about anti-CCPs below) only in SE-positive patients . In a national case–control study, tobacco smoking was related to an increased risk of anti-CCP-positive RA . The investigation of consecutive sera of RA patients in a rheumatology clinic has shown that anti-CCP titers were associated with tobacco exposure . Smoking increases the risk of anti-CCPs only in shared epitope-positive patients . Smoking is related to an increased risk of anti-CCP-positive RA . Higher anti-CCP titers are associated with tobacco exposure. Anti-CCP seropositivity is associated with a higher incidence of erosions. Moderate correlation between anti-CCP and rheumatoid factor titers . Previous smoking is dose-dependently associated with occurrence of anti-CCPs. Presence of double copies of shared epitope alleles confers about 20-fold risk for anti-CCP-positive RA in smokers . There is an increased risk for anti-CCP-positive RA in heavy smokers with homozygote shared epitope alleles . HLA-DRB1*0401, HLA-DRB1*0404, HLA-DRB1*0405, or HLA-DRB1*0408 shared epitope alleles confer the highest risk of developing anti-CCPs. Smoking-shared epitope interaction is highest in case of HLA-DRB1*0101 or HLA-DRB1*0102 and HLA-DRB1*1001 shared epitope alleles . Current or former tobacco smoker anti-CCP-positive RA patients show a more extensive anti-CCP isotype usage, valid for shared epitope-negative RA patients too . Presence of at least one shared epitope allele (especially the DRB1*0401 allele) is related to the presence of anti-CCPs . There is an association between smoking and anti-CCP in the NARAC and the Inception Cohort, but not in the SONORA. Only the NARAC cohort supports evidence for the interaction of smoking and shared epitope alleles in anti-CCP-positive RA . There is no association between smoking and anti-CCPs . There is an association of smoking, HLA-DRB1 shared epitope alleles and anti-CCP-positive RA. No interaction between smoking and PTPN22 is found . CCP, cyclic citrullinated peptide; EIRA, Epidemiological Investigation of Rheumatoid Arthritis; Inception Cohort, National Inception Cohort of Rheumatoid Arthritis Patients; NARAC, North American Rheumatoid Arthritis Consortium; PTPN22, protein tyrosine phosphatase nonreceptor 22; RA, rheumatoid arthritis; SONORA, Study of New Onset Rheumatoid Arthritis. In a case–control study involving patients with early-onset RA, Klareskog and colleagues found that previous smoking is dose-dependently associated with occurrence of anti-CCPs in RA patients. A major gene–environment interaction was also observed between smoking and HLA-DR SE genes: the presence of double copies of SE alleles confers about 20-fold risk for anti-CCP-positive RA in smokers . A nationwide case–control study involving known and recently diagnosed RA patients conducted in Denmark has also proved strong gene–environment effects: there was an increased risk for anti-CCP-positive RA in heavy smokers with homozygote SE alleles . In the study of the Leiden Early Arthritis Clinic, the HLA-DRB1*0401, HLA-DRB1*0404, HLA-DRB1*0405 or HLA-DRB1*0408 SE alleles conferred the highest risk of developing anti-CCP antibodies, and the smoking-SE interaction was highest in cases of HLA-DRB1*0101 or HLA-DRB1*0102 and HLA-DRB1*1001 SE alleles . The same clinic has confirmed that anti-CCP-positive RA patients, who are current or former tobacco smokers, show a more extensive anti-CCP isotype usage compared with nonsmoker anti-CCP-positive patients; these observations were also valid for SE-negative RA patients . In a French population of RA patients (one-half of them were multicase families), the presence of at least one SE allele (especially the DRB1*0401 allele) was related to the presence of anti-CCP antibodies ; smoking was associated with anti-CCP antibodies only in the presence of SE, and the cumulative dose of cigarette smoking was linked to the anti-CCP antibody titers. A case-only analysis of three North American RA cohorts – RA patients from the North American Rheumatoid Arthritis Consortium (NARAC) family collection, from the National Inception Cohort of Rheumatoid Arthritis Patients, and from the Study of New Onset Rheumatoid Arthritis (SONORA) – has shown an association between smoking and anti-CCP in the NARAC and the National Inception Cohort, but not in the SONORA . The SE alleles correlated with anti-CCP in all cohorts. Only the analysis of the NARAC cohort provided some evidence, however, for gene–environment interaction between smoking and SE alleles in anti-CCP-positive RA. In a study of African Americans with recent onset of RA, there was no association between smoking, anti-CCP antibody, IgM-RF or radiographic erosions . A recent report comparing three large case–control studies – the Swedish Epidemiological Investigation of Rheumatoid Arthritis study, the NARAC study, and the Dutch Leiden Early Arthritis Clinic study – has reinforced the previous results ; namely, the association of smoking, HLA-DRB1 SE alleles and anti-CCP-positive RA. No interaction was found between PTPN22 R620W and smoking, however, indicating that smoking may have disadvantageous effects only in genetically susceptible individuals (for example, those carrying SE genes). To conclude, these data suggest there may be an association between smoking, SE alleles and ACPA-positive RA. Further environmental and genetic factors (because the studies involving Americans show a more complex picture of RA risk factors), however, should also be considered. A long time ago RA sera were revealed to specifically react to filaggrin (found physiologically in keratin), which has been proven to be a citrullinated protein; however, light has been shed on the importance of citrullinated proteins only in recent years. Commercial kits are nowadays available to detect ACPAs: these antibodies react to synthetic CCPs – hence the name anti-CCPs. ACPAs are markedly specific for RA – only a small percentage of the general population carries them . Antibodies (for example, anti-filaggrin) against citrullinated proteins – such as vimentin, fibrinogen, type II collagen, alfaenolase – usually arise several years prior to disease onset . Citrullination is catalyzed by PADs dependent on a high calcium concentration. Five PAD isoforms (PAD1, PAD2, PAD3, PAD4 = 5, PAD6) are currently distinguished. Proteins lose specific positive charges through deimination (arginine → citrulline) and can change conformation, becoming more susceptible for degradation . Physiologically, citrullination takes place in the epidermis and the central nervous system. Pathologically, an increased citrullination has been observed in the lining and sublining of joints and also in extraarticular regions in RA . Citrullination is not specific for RA, however – other rheumatologic diseases with synovitis, including inflammatory osteoarthritis, reactive arthritis, undifferentiated arthritis, gout and even trauma, show the presence of citrullinated proteins . The highly specific ACPAs are therefore the results of factors other than local inflammation, involving genetic and environmental factors. Only PAD2 and PAD4 isotypes are expressed in the synovium of RA patients (and also other arthritides) . Their sources are probably inflammatory cells; for example, dying human macrophages and lymphocytes produce citrullinated vimentin, which, if released into the extracellular matrix of RA synovium, can specifically react with sera of RA patients. Anti-CCPs are highly specific for RA, but they are found in 5 to 13% of patients with psoriatic arthritis  and also a minority of patients with primary Sjögren syndrome have an elevated anti-CCP titer, which is linked to the presence of synovitis . Whether smoking confers a risk for the development of anti-CCPs in otherwise healthy individuals has not been investigated, but increased protein citrullination can be seen in the bronchoalveolar lavage of healthy smokers . Smoking is associated with several autoimmune diseases such as systemic lupus erythematosus, primary biliary cirrhosis or multiple sclerosis, where similar gene–environment interactions may exist – the knowledge gained from research into these diseases could also help in the understanding of RA. For example, Moscarello and colleagues have proposed that citrullinated myelin basic proteins may have a crucial role in the pathogenesis of multiple sclerosis : as in RA due to citrullination, myelin basic protein may become more susceptible for degradation by metalloproteases. In primary biliary cirrhosis, celiac disease or systemic lupus erythematosus, antibodies against self-enzymes involved in protein modification (deamidation, carboxylation, glycolysation) also exist, like the anti-PAD antibodies in RA (see later). It is well known that smoking has a pivotal role in the development of lung cancer. Smoke contains several carcinogens, leading to severe DNA damage via adduct formation and subsequently altered gene function. Contact-mediated cytostasis of tumor cells is also decreased by AMs of smokers . As mentioned in a previous section, components in smoke have significant immune modulator effects (they alter the functions of T cells and B cells, macrophages, dendritic cells and neutrophils) on several acting points involving the reduction of the production of TNFα. Apart from the direct cytotoxic effects of TNFα against tumors, its antitumor activities may involve activation of different neutrophil functions, alteration of endothelial cell functions and increased production of IL-1. As a consequence, the inhibition of TNFα (as an anti-tumor agent) via smoke components may contribute to (lung) cancer formation besides the crucial effects of direct carcinogens found in smoke. In the pathogenesis of RA, TNFα plays a key role considering the joint and bone damage. Increased levels of TNFα can be measured at the sites of inflammation. Moreover, transgenic mice expressing high levels of TNFα develop RA-like arthritis. In an animal model of collagen-induced arthritis, the inhibition of TNFα led to the amelioration of disease course. Later, extensive multicentric studies proved the beneficial effect of TNF blockage in RA , and nowadays TNF antagonists are widely used. In RA patients who smoke, an elevated ratio of TNFα/soluble TNF receptor released from activated T cells can be seen – which may contribute to the increased TNFα activity observed in RA. The ratio is related to the extent of smoking – sustained even after smoking cessation – proving why smoking intensity and duration have an impact on the development and course of RA . Considering the TNFα-lowering effect of cigarette smoking, one could also suggest that TNFα should have beneficial effects on RA, even though the opposite is probably true. Other pleiotropic factors (oxidative stress, infections, citrullination) of smoke components rather than the TNF antagonism alone, evoked by nicotine, may therefore be the main susceptibility factors of disease development. To support this hypothesis, in both types of inflammatory bowel disease (ulcerative colitis and Crohn's disease), in which smoke has an opposite role, TNF antagonists are beneficial and are crucial components of the therapeutic repertoire. Nowadays, three TNF antagonists exist – etanercept, a soluble fusional receptor; infliximab, a chimeric monoclonal antibody; and adalimumab, a completely human monoclonal antibody – and two other TNF antagonists (certolizumab and golimumab) are in clinical development. There are concerns about using biological agents, however, as the incidence of malignancies, especially lymphomas, may be increased compared with the normal population. The increased proliferative drive of immune cells resulting in autoantibody formation and disease severity rather than TNF antagonism or disease-modifying antirheumatic drugs (methotrexate) seems to be responsible for the elevated lymphoma risk, which is supported by the recent analysis of the Swedish Biologics Register . On the contrary, a previous meta-analysis of randomized trials of anti-TNF therapy has revealed a dose-dependent increased risk of malignancies in RA patients treated with anti-TNF antibodies . In conclusion, patients treated with TNF antagonists should be closely followed regarding malignancies. Data suggest that smoking has immunosuppressive effects through the various substances contained in cigarette smoke, among which nicotine has the most substantial role (Figure 1). Nicotine can enter the bloodstream through the alveolar compartment-endothelial barrier, and then may reach different parts of the body, including lymphoid tissues, where it may have systemic immunomodulator effects and may act through the nicotinic receptors of the autologuous nervous system. Owing to immunosuppression evoked by smoke, infections are increased not only in the respiratory tract but in other regions of the body. Complex role of smoking in the pathogenesis of rheumatoid arthritis. ACPA, anti-citrullinated protein antibody; AP-1, activator protein-1; EBV, Epstein–Barr virus; HQ, hydroquinone; IRF-5, interferon regulatory factor 5; nACh, nicotinic acetylcholine; PAD, peptidyl arginine deiminase; PADI4, gene of peptidyl arginine deiminase type 4; PTPN22, protein tyrosine phosphatase nonreceptor 22; RA, rheumatoid arthritis; RF, rheumatoid factor; SE, shared epitope. Superantigens of specific bacteria (Streptococcus, Staphylococcus) and viruses (Epstein–Barr virus (EBV)) bypass the processing of antigen-presenting cells through directly binding to MHC II molecule T-cell receptors outside the conventional antigen-specific variable chains, initiating massive T-cell activation (up to 20% of total). In addition, they may utilize not only the T-cell receptor pathways but also other pathways . A wide repertoire of T cells may be activated due to superantigens, and also those cells reactive to citrullinated proteins or autodeiminated PADs (see below) in the respiratory tract. In line with this knowledge, specific bacteria and viruses have been incriminated in the pathogenesis of RA – one of which is EBV. Pratesi and colleagues found that sera from RA patients can react to citrullinated EBV nuclear antigen , which suggests previous EBV infection (superantigen) and also the presence of parallel citrullination – which might be induced by chronic smoking, as the amount of citrullinated proteins is increased in the bronchoalveolar lavage of smokers. The role of EBV in the RA pathogenesis is supported by several other data: the anti-EBV titer is elevated in RA patients; certain EBV antigens share similarities with synovial self-autoantigens providing the possibility of viral cross-reactivity; the gp110 glycoprotein in EBV contains a copy of SE; cell-mediated responses against EBV proteins were found in the synovial fluid of RA patients; and EBNA-1 can undergo citrullination, and the virus can induce antibody formation against citrullinated proteins . Another explanation for the primary steps towards RA might be bacterial/viral cross-reactivity with autoantigens, as in the case of EBV. On the one hand, Porphyromonas gingivalis causing periodontitis has a functional PAD enzyme, which is quite similar to human PADs, and subsequently the infection may stimulate antibody production against the human PADs as well . The incidence of periodontitis is elevated due to smoking , so the body might be exposed to a more increased burden of P. gingivalis causing a constant antigen trigger compared with nonsmokers. Autoantibodies against PAD4 enzymes are specific markers of RA, they exist in about 40% of RA patients, and they account for more severe disease course. Polymorphisms in the PADI4 gene (only in certain populations) may influence the immune response to PAD4 enzyme, potentially contributing to disease propagation . It is also reported that PADs can autodeiminate themselves, due to which the structure of the molecule might be changed profoundly and new epitopes may arise. Furthermore, the modified citrullinated proteins and PAD may create an altered molecule complex like the tissue transglutaminase and deaminated gluten in celiac disease, which may result in autoimmune reaction in genetically prone subjects. On the other hand, emerging data suggest there might be a connection between RA and Proteus mirabilis. These data are supported by the following observations. There is an increased incidence of urinary tract infections (especially P. mirabilis) in RA patients . Furthermore, Ebringer and Rashid have found sequence homology between certain HLA alleles associated with RA and hemolysins of P. mirabilis. They also identified another homology between type XI collagen and Proteus urease enzyme, yet they have failed to show common motifs between P. urease and RA-targeted synovial structures even though active RA patients have elevated IgG and IgM antibodies against Proteus . Consequently, due to infections, cross-reactivity might arise against auto-structures of joints. Similarly, CD19+ B cells capable of secreting antibodies reactive to type II collagen are present in both RA patients and in healthy subjects. In RA patients, however, the cells accumulate in the inflamed joints, suggesting that they have been activated due to certain factors (possibly superantigens or cross-reactivity) . It is known that synovitis in general, also in nonautoimmune rheumatic diseases, is marked by citrullinated proteins, although the presence of ACPAs is specific for RA, and is likely to be the result of many tolerance-breaking immune steps. Neeli and colleagues have found that LPS-induced neutrophils can produce marked citrullination of histones, which then can be identified as the components of extracellular chromatin traps . Bacterial invasion can provide the perfect background for neutrophil activation and subsequent release of highly autoantigenic citrullinated histones in the respiratory tract. Besides common environmental factors, intrapersonal and interpersonal psychological factors may also contribute to RA pathogenesis. To support this hypothesis, RA patients with an elevated daily stress level (daily hassles, interpersonal conflicts) have poorer outcome and more erosions, while major stress (major negative life events) might ameliorate the disease course. Long-lasting (chronic) minor stress may lead to proinflammatory responses via short-lived surges of hormones and neurotransmitters, yet major stress might lead to massive, long-lived release of stress-axe mediators of the hypothalamic–pituitary–adrenal axis (norepinephrine, cortisol, and so forth), resulting in anti-inflammatory responses . Smoking might sustain a constant minor stress in the body via its addictive nature, and subsequently may lead to neurohumoral immunomodulation. To summarize, if the constellation of genetic factors – for example, HLA-DRB1 as it has a higher affinity to bind citrullinated form of proteins , and perhaps other loci in different populations such as the North American population – and of environmental factors – smoking, concomitant infections (cross-reactivity, molecular mimicry) and also general stressors (psychological as well) – is created, there is a possibility for autoimmune disease development. As citrullination is considered one of the crucial steps in the development of RA, and also as ACPAs seem to be involved in the progression of RA, new pharmaceutical agents targeting PADs have been investigated: PAD inhibitors including F-amidine (the most potent known inhibitor), paclitaxel and 2-chloroacetamidine . Their clinical utilization is a little controversial, however, as ACPAs can appear several years prior to the development of RA, and at the time when healthcare professionals are able to interfere with the pathological processes of their patients, the vicious circle of the autoimmune process has already started, and may be sustained by factors other than citrullination. Moreover, we know little about the physiological functions of PADs – so their inhibition may involve serious disturbances in the cells, such as apoptosis . The connection of smoking, anti-citrullinated antibodies and RA is unambiguously proven by several studies and reports. Consequently, it is essential to inform patients about the hazardous role of smoking in the development and progression of RA. Moreover, as the autoimmune diseases in general cause accelerated atherosclerosis due to constant inflammation, and increase the cardiovascular risk, it is important for patients to understand smoking cessation is required as much as taking disease-modifying antirheumatic drugs or biologics to achieve remission and better life quality. Although we have an effective therapeutic repertoire for RA, we cannot reverse the developed joint deformity in advanced stages, so the initiation of the early treatment prior to bone and joint damage has great importance. To achieve this early initiation, we need to better understand the pathogenesis of the disease and the interaction of risk factors, and also to develop better diagnostic tools on the basis of this information. The present work was supported by grants OTKA K73247, OTKA T046468, OTKA F61030 and OTKA 77537, and a Marie Curie Research Training Network grant (contract number MRTN-CT-2005-019561).